Transmitter Music, Australia’s home of ska, roots and reggae is hosting it’s first annual event – A night dedicated to showcasing the great diversity of bands who draw inspiration from the offbeat rhythms of the Caribbean and the varieties of musical styles those islands inspired. OPERATION OFF-BEAT: Mission #1 – Get MSO to Glastonbury ! help the Melbourne Ska Orchestra with airfares for their Glastonbury Festival show in the UK and Montreal Jazz Festival in Canada. > Vinyl spinners, DJ’s JESSE I (PBS) and SISTA BB(RRR) will set the vibe between sets with rare Jah 45s. > Also a special prize for the BEST DRESSED COUPLE! 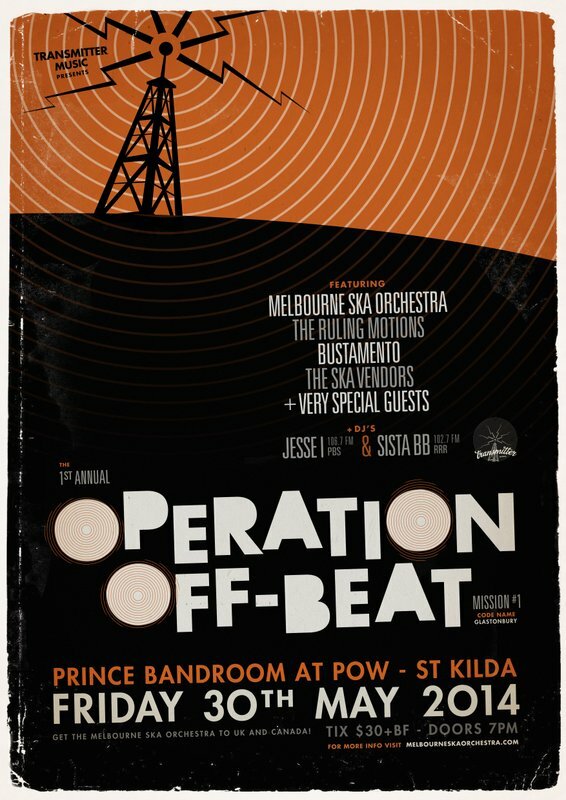 Style up, get on down, help the MSO take on the Northern Hemisphere, and make this first OPERATION OFFBEAT mission a skankin’ success.